His real name was Abd al-‘Uzza. The Qur’an names him as “Father of Flames” which means “Abu Lahab”. The wife of Abu Lahab was Umm Jamil. Every night, Umm Jamil bunched cockleburs, thorns and thorny branches and knit them together on her neck, threw and spread them on the way of the Prophet Muhammad (PBUH) so that they would sting on his foot and thus hurt him at night. We refer the persecution and cruelty of these two people against Muslims to the related books and analyze only the news of this surah related to the Ghayb (unseen, unknown) and its turning out to be true. The surah of Tabbat informed us that Abu Lahab and his wife would die on disbelief. And this turned out to be true as it had been informed. This surah gives news from the Ghayb. It is not possible for a person to know the Ghayb and future on his own and to inform about the end of some people. Since it is not possible, we can say that the Qur’an which informs about the Ghayb is the book and word of Allah. The Qur’an informs us that Abu Lahab and his wife would die on disbelief and go to Hell. How do those who do not accept the Qur’an as the book of Allah and deny it can answer the following questions? 1- Abu Lahab died seven years after the revelation of the surah of Tabbat. That is, the verses of Tabbat were not revealed while Abu Lahab was on his dead bed; contrarily they informed about his end seven years earlier. If it were not the book of Allah –God Forbid- then how could a person know that Abu Lahab would die on disbelief? 2- At the beginning of Islam, there were many enemies of Islam, but as the time passed, all of them entered Islam one by one and pledged allegiance to the Prophet (PBUH). Among them were also people such as Khalid ibn al-Walid, Abu Sufyan, Amr ibn As, who had fought against Muslims. Besides, there were people like Hz. Wahshi, who martyred Hz. Hamzah, and Hz. Hind, who removed the heart of Hamzah. All of these people repented for what they had done and deserved the titles of “Sahaba” and “Hazrat”. Just like these people, it was possible for Abu Lahab and his wife to repent and this would have been natural. However, it was revealed by the Qur’an that they would not repent and die on disbelief. So if the prophet Muhammad (PBUH) were not the apostle of Allah and the Qur’an were not the word of Allah then how had it been known that Abu Lahab and his wife was going to die on disbelief? 3- A wise person does not assert a claim regarding subjects that will make him a liar. Above all, he does not say anything about the Ghayb (unseen) that will refute him. Now think of the following: The Qur’an says, “Abu Lahab and his wife will die on disbelief”. If Abu Lahab or his wife had said that “I became a Muslim and repented”, the aforementioned news of the Qur’an would not have turned out to be true and this would mean the cancellation of the case of the Qur’an. And if Abu Lahab or his wife had said, “We became Muslims” in a misleading manner as a hypocrite, then the trueness of the Qur’an and the Prophet Muhammad (PBUH) would have been destroyed at once. While the Qur’an says, “he will die on disbelief”, that person will say “I have become a Muslim”. So how could you explain the news of the Qur’an from Ghayb? The Qur’an stated that Abu Lahab and his wife would die on disbelief during a very critical moment and Abu Lahab died on disbelief after seven years as it had been informed. 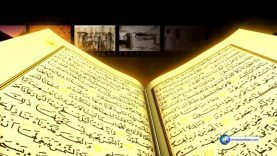 If the Qur’an were not the word of Allah but a fictitious work of a person –God forbid- then could that person claim such a thing which would reveal his lie? Would you do so, if you were him? Of course not! Then how can you explain this news and its trueness other than the fact that Qur’an is the word of Allah? Yes, The Qur’an says “He will die on disbelief” and he died on disbelief after seven years. Despite of all of his enmity, he could not say, “I believe” in a factitious way in order to refute this verse of the Qur’an. He could not utter the word of belief even for appearance sake. In order to know this, it is necessary to be Pre-Eternal and Post-Eternal and have the knowledge of all times and places at the same time and this attribute belongs to Allah Almighty only. So, we give the Qur’an’s future information about the death of Abu Lahab and his wife on disbelief and the complete trueness of this news as a proof and say that the Qur’an is the book and word of Allah who knows the worlds of Ghayb best. The news of Qur’an from the unseen/unknown (Ghayb) cannot be explained by anything other than this decree.